CIOCC for the passionate cyclist, is a mark that recalls the beginnings of the great Italian handcraft tradition in the production of frames. It was 60 years ago, that CIOCC working from a small artisan shop, produced high quality frames for some very demanding professional riders. Sixty Years on and CIOCC still present in the professional ranks, as a confirmed leader in the production of race frames. Picking up along the way extraordinary successes, such as the 1977 world championships and the Olympiads of “Mokoba “ in1980. Professional Teams of prestige SANTINI CONTI KRUPS, ITALBONIFICA NAVIGARE and others have been equipped with CIOCC cycles, reaching international successes. As the company evolved, it has seen different changes of ownership. In 1991, the CIOCC trade mark and brand became ownership of Stefano Bonati, Cesare Biondi and Biffi Giuseppe, who realised the importance of its origins and how to maintain the traditions, characteristics and attention to detail of the brand as it evolves in to a new era offering production of carbon fibre frames. 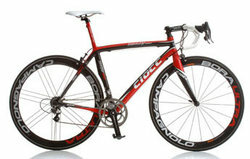 Today, CIOCC is still a market leader, offering unique bicycles for quality, design and performance. Manufacturer of frames for racing bikes in carbon fiber or stainless steel.